Sediments in wine are a rather unsettling, yet harmless, manifestation of natural grape elements. Tartaric acid occurs naturally in grapes and is an essential chemical to the winemaking process. By increasing the acidity of the fermenting must, tartaric acid prevents bacterial spoilage and, as an antioxidant, it naturally preserves wine. Most often, tartaric acid and potassium will combine under cool storage conditions to form potassium bitartrate (also known as potassium hydrogen tartrate) crystals. 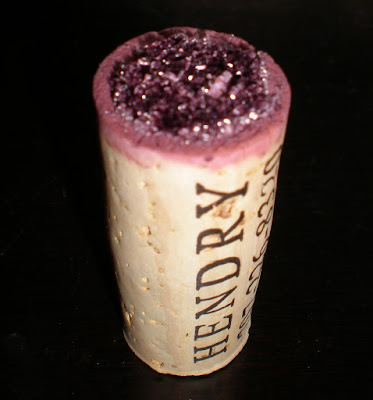 The resulting substance, often assumed to be shards of glass by the unsuspecting neophyte, is frequently removed by American winemakers through cold stabilization, a process by which crystal formation is induced prior to bottling through chilling the wine to near freezing temperatures. Some winemakers, especially traditional European wineries, believe that cold stabilization threatens subtle flavors and mutes the unique characteristics of the wine. Tartrate crystal precipitate is often found adhered to the inside of ageing barrels or affixed to the cork or neck of the bottle. Allowing the bottle to sit upright prior to opening may allow most of the crystals to settle in the bottom of the bottle, enabling easier separation through decanting. Recently I purchased a quality Napa Valley Zinfandel from a reputable Orange County, CA vendor that stored it in a climate controlled environment. Upon purchase, I transferred the bottle to my wine cellar, which is maintained at a stable 55 degrees Fahrenheit, where it was stored for a couple of months. 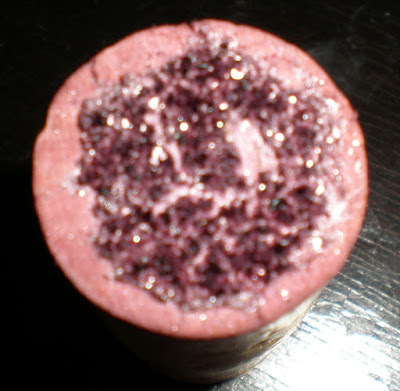 When the bottle was opened, tartrate crystals were prominently affixed to the bottom of the cork (see photos) signaling that sedimentation had occurred during storage. Some crystals had settled to the bottom of the bottle, but there was substantial precipitate that settled on the neck of the bottle just above the wine level and below the former position of the cork. After removing the sediment on the neck of the bottle, the wine was carefully decanted directly into wine glasses which largely prevented the transfer of any of the tartrate crystals. While I did not have an unadulterated reference bottle for comparison, there appeared to be no noticeable impairment of flavor of the wine.